With the Senate on Thursday passing its version of immigration reform on a 68-32 vote, Americans are broadly supportive of its overall thrust but divided on issues of timing. According to a new Pew Research Center/USA TODAY survey, 71% of Americans say undocumented immigrants who meet certain requirements should be allowed to stay in the country. And 77% say any legislation allowing them to do so also should provide for increased security along the borders. 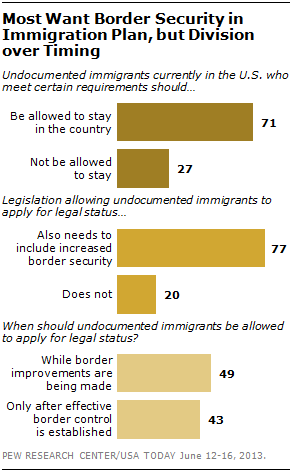 The key difference, however, is how those two policy elements mesh together: 49% say undocumented immigrants should be allowed to apply for legal status while border improvements are being made, but 43% say they should have to wait until effective border control has been established.